Until last week, we had the world’s least attractive front garden. Now it’s a very attractive place to park our car that perfectly matches my skills as a gardener. Hidden in the hedge between our house and our neighbours’ was the original iron fence. These are a real rarity, since most were taken and melted down during the Second World War. The humble iMac that hosts ridey.net, and is also my mail server as well as the main family computer, has shattered its previous uptime record. As I type this entry, it has been 21 days, 11 hours and 19 minutes since the last reboot. Let’s see you do that on a Windows PC. It’s almost as if the old iMac knows its days are numbered and is trying to convince me that I really don’t need that new Mac mini I’ve got my eye on. Update: At 26 Days, 22 Hours, 45 Minutes, a software update from Apple required the iMac to be restarted. Darn! The ever-expanding ridey.net webcam community can now be viewed in one place. 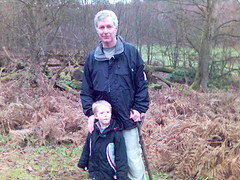 Charlie and Daddy during our walk in the Abinger Roughs. It was a bit of a rainy, gloomy New Year’s Day, but we enjoyed it none the less.